Every time I think of the Roberto Soldado transfer to Spurs I can’t help but think the North London club could have done better. Perhaps in the modern game money doesn’t really matter and clubs are determined to get their target regardless of the asking price. However, call me old fashioned, but I like to get value for my money and thus I’ll appraise Soldado in terms of how Tottenham did in terms of Value For Money. Yes, he scored 24 goals last season in Spain’s top flight and on the basis that Tottenham expect someone other than Gareth Bale to score their goals they needed someone who could put the ball in the net with a little more regularity than Jermaine Defoe and Emmanuel Adebayor have been able to in recent times. But my over-riding belief is that they could have put the transfer fee of £26.5m to better use in my opinion. He is 28 years old, and he still has a decent few years playing time left but given his age he’s unlikely to improve much and he will certainly have a minimal resale value at the end of his contract. But that’s not the main reason for my dissatisfaction; my main gripe is the fact that his conversion rates really aren’t overly special. And special conversion rates are what I would expect from someone who I’m paying close to £30m for, even more so when he’s not being bought for his creativity (with less than 1 key pass per90 last season). It might seem strange to say that his conversion rate is nothing special given that last season he converted his 100 shots at a clip of 24%. On the face of it, this favourably compares to Van Persie (18%), Bale (13%) and Lukaku (17%). In fact in the Big 5 Leagues last season, of the players to score more than 15 goals only Cvitanich, Messi and Higuain had a higher conversion rate than the former Valencia striker. However, regular readers of my pieces will know that we need to provide a little more context than just the player’s raw conversion rates. We need to compare the conversion rate against what their conversion rates should have been when accounting for the shots that the players attempted. On this “shot quality” adjusted measure Soldado no longer sits atop of the rankings. His ExpG Eff rate (as discussed in this previous piece) was 1.01. Don’t get me wrong, 1.01 means that he finished his shots a tiny bit better than the average player did but it’s pretty damn close to being just an average conversion rate of the chances he attempted. When I was at school I would have been called a “moocher” if I had those shot locations. 59% of Soldado’s shots were struck from centrally within the penalty area, and he only had 10 shots from outside the penalty area. In his defence, it is great that he was there to attempt those shots, and he puts them away with decent, nay average, aplomb. But I feel that the raw conversion rates that he has posted drove the transfer fee to a higher range than it otherwise should have been. He didn’t score any more goals than the average player would have done if they had been lucky enough (or perhaps good enough) to be presented with those opportunities. Credit undoubtedly needs to be given to him for being in the right place at the right time, but all I’m asking for is that the location of his shots are taken into account when attempting to analyse his shooting performance from last season. The measure that Constantinos Chappas and I have created that objectively rates the quality of chances that a team or player is presented with is the Average ExpG. This quantifies the probability of the average shot taken by the team or player in question. According to my records, 102 players in the Big 5 leagues scored more than 10 goals last season. Rather interestingly, Soldado’s Average ExpG value is 2nd highest out of those 102 players. The quality of the chances he attempted was second only to Pazzini of Milan. Just let that settle in for a second……. The chances he attempted were from the 2nd most attractive locations in the Big 5 leagues. That fact is ultra-important but it has generally been overlooked in most of the analysis of Soldado’s transfer that I have seen. And that is the primary reason why if I ran a football club I wouldn’t have spent £26.5m on taking him from Valencia. I read with interest the suggestion made by Ted Knutson in his preview of Tottenham on this site that, in a worst case, the acquisition of Soldado may ensure that Spurs get a much more interest Adebayor. I guess that may just be true, but if so, you would have hoped that Spurs could have come up with a cheaper performance management system!!! As a general point, I want to make the readers aware that I would have loved to be able to go back and include data from before the start of last season and see what his shots were like then. But unfortunately I am limited to the data that Squawka provides us with, and that is only one season at this stage. One other thing that I’m not totally at ease with is how Soldado’s style appears to be polar opposite to how Spurs has played in the recent past. 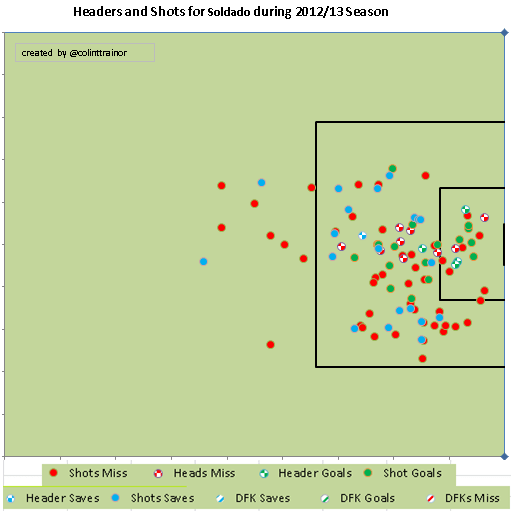 You can see that Soldado thrives on putting away very good chances. I wonder if he is aware how Spurs played football last season? He is moving to the only team in the Premier League who took more than 50% of their shots from outside the penalty area. Working the ball into areas that most people would feel are good shooting opportunities certainly wasn’t top of Tottenham’s “How to Play Football” manual last season. Perhaps his signing suggests that Gareth Bale is indeed leaving White Hart Lane this summer and thus Soldado is more likely to receive the sort of service that he has been used to. However, in the event that Bale does stay with Spurs for another season I would fear that Roberto Soldado could cut a rather frustrated figure as he ducks to get out of the way of Bale’s long range efforts. OK, so it’s easier to criticise an action than it is to do something positive yourself. So after claiming that Spurs could have done better in their search for a striker I think that it is only fair if I suggest a few alternatives as to how Levy’s £26.5m could have been better spent. In my next piece I will outline a pool of strikers that I would procure from if I was tasked with doing so.